From the agent community, there's understandably a lot of speculation in the wake of the Viking Sky incident. 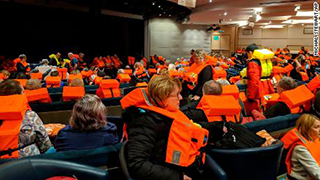 Agents note that even experienced cruise pax travelling on adventurous itineraries rely on cruise lines to make the decisions on what's safe: whether it's itinerary selection or the captain's choices during harsh weather. It makes thinking people pause. "Nothing against Viking," one agent emailed to Cruise Week on Sunday, after saying she would never book clients on an itinerary to a region known for harsh weather and rough waters at this time of year. But another agent puts it in perspective: "We face the same decision any time we put somebody on a South American cruise that goes around the Cape. I have to confess that every time we sell that itinerary to somebody, the thought crosses my mind that there are rough waters down there and maybe more opportunity for something to go wrong than on a normal cruise." People who book with veteran advisors probably know in advance that a cruise travelling in the Arctic during winter, or one that goes around Cape Horn, can experience harsh weather conditions. For the most part, these are very experienced cruisers looking for a new experience. Agents Cruise Week talked to praised the experienced passengers on Viking Sky. There was comparatively little media grandstanding (unlike some other cruise incidents we've covered), just solid, clearly honest reports from people, some who were very scared, about the difficult experience. "I would have wanted to go on a cruise with these people,” one advisor said. “Sometimes you look at these situations with storms at sea and all the problems and the furniture rolling around and you see people talking about like they were experiencing the Titanic. They totally lose it." Another agent commented: "It's unfortunate that something like this happens, but from a positive standpoint the likelihood that there are many first-time cruisers on Viking Sky is between slim and zero. My educated guess is there are a few first-time cruisers on Viking Sky and they are the ones who have tweeted and reacted the way they did. "But in the main, you're looking at passengers on this ship who are experienced cruisers, who are more mature. "While they're certainly not happy with what was going on, it's one of those things if you've been on 20 or 30 cruises and then something like this happens, while it's certainly not what you planned on, it's not the end of the world. "Plus, from what we've heard, the crew appeared to have handled it well."